Searching for a check design that's just right? This elegant monogram featuring a ornamental letter 'J' is just the thing! 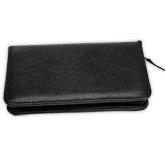 You'll give your purse or pocketbook something fresh and fashionable. The subdued beige background gives you a straightforward check design that still has plenty of personality! You can also choose from a variety of other monogram styles and add them to any of our personal check design during checkout. Choose J Monogram Checks and portray professionalism and poise every time you write a check. Matching labels are also available.